Azure SQL Database Threat Detection has been in preview for a few months now. We’ve onboarded many customers and received some great feedback. We would like to share a few customer experiences that demonstrate how Azure SQL Database Threat Detection helped address their concerns about potential threats to their database. Azure SQL Database Threat Detection is a new security intelligence feature built into the Azure SQL Database service. Working around the clock to learn, profile and detect anomalous database activities, Azure SQL Database Threat Detection identifies potential threats to the database. Security officers or other designated administrators can get an immediate notification about suspicious database activities as they occur. Each notification provides details of the suspicious activity and recommends how to further investigate and mitigate the threat. Currently, Azure SQL Database Threat Detection detects potential vulnerabilities and SQL injection attacks, as well as anomalous database access patterns. The following customer feedback attests to how Azure SQL Database Threat Detection warned them about these threats as they occurred and helped them improve their database security. “Azure SQL Database Threat Detection is an incredible feature, super simple to use, empowering our small engineering team to protect our company data without the need to be security experts. Our non-profit company provides user-friendly tools for mental health professionals, storing health and sales data in the cloud. As such we need to be HIPAA and PCI compliant, and Azure SQL Database Auditing and Threat Detection help us achieve this. These features are available out of the box, and simple to enable too, taking only a few minutes to configure. We saw the real value from these not long after enabling Azure SQL Database Threat Detection, when we received an email notification that ‘Access from an unfamiliar IP address (location) was detected.' The alert was triggered as a result of my unusual access to our production database from home. Knowing that Microsoft is using its vast security expertise to protect my data gives me incredible peace of mind and allows us to focus our security budget on other issues. Furthermore, knowing the fact that every database activity is being monitored has increased security awareness among our engineers. Azure SQL Database Threat Detection is now an important part of our incident response plan. I love that Azure SQL Database offers such powerful and easy-to-use security features. Azure SQL Database Threat Detection is incredibly easy to enable. You simply navigate to the Auditing and Threat Detection configuration blade for your database in the Azure management portal. There you switch on Auditing and Threat Detection, and configure at least one email address for receiving alerts. Learn more about Azure SQL Database Threat Detection. 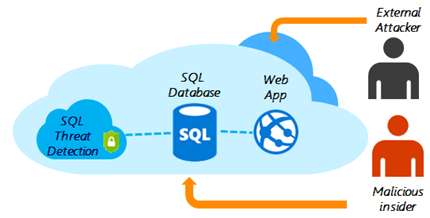 Learn more about Azure SQL Database. We'll be glad to get feedback on how this feature is serving your security requirements. Please feel free to share your comments below.